Audio Damage has released a string of must-have plug-ins over the past couple of years. Here's another one. A stunning, original implementation of familiar concepts. Dr. Device should be a must-buy for all discerning producers. Simple and fun to use. Sounds fantastic. Extremely versatile. Insanely cheap. Original concept. Our secret production weapon is no longer so secret! Dr. Device is a combined filter and delay effect. You'll find the filter section at the top-left of the interface - this comprises the usual frequency, resonance and filter type controls (high-, low- and band-pass), and a few other nice touches too (such as a gain control, a bit-crusher and analogue-style saturation). On the other side we have the delay section, offering independent left and right controls, where the delay of the right channel is determined by a multiplier in relation to the left channel (1:1, half-speed, double-speed, etc). In practice, this works brilliantly. The feedback control enables you to set just one repeat or whack it up until the plug-in screams. The delay can be up to two seconds in length and can be synced to the host tempo for more coherent results, while a stereo width knob controls the channel balance from fully panned left or right, to both in the centre. A standard wet/dry mix knob controls the balance of original signal to delayed signal. You can then choose from proper tape delay-style echoes that have marked top-end reduction with each successive delay, or a digital mode with a more gentle treble roll-off. But the best is yet to come. The delay and filter sections are connected to a real-time performance matrix that enables simultaneous control of up to six freely-assignable parameters using two three-parameter controls called Nubbies. This system uses an X/Y/Z matrix, where X and Y are the axes in a square control matrix and Z responds to mouse-clicks on the Nubbies. It's almost impossible to explain how cool this is in words, but let's just say that with synced but random (or recorded) movements, automation and real-time hands-on control, it produces the most awe-inspiring evolving sweeps, textures, wah-wahs, delays and solidly-timed sonic mayhem imaginable. Make no mistake, Dr. Device will blow you away. So, here we have a plug-in that's a doddle to use and you can throw almost any signal at. The results that you get are at worst usable, and at best stunning and completely original. 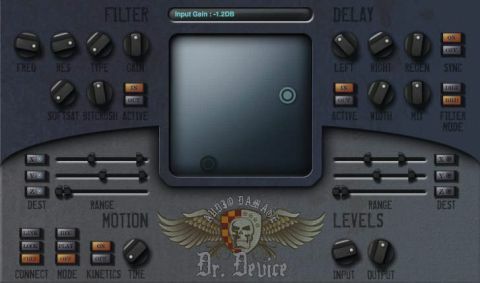 Dr. Device is great whether used delicately, to extremes, for effects, as a lead or even as the basis for an entire track. You simply won't get these sounds and effects anywhere else. And trust us - you really do want these sounds and effects.